Advanced practice registered nurses (APRNs) have been enjoying steadily increasing autonomy, and their importance to the smooth operation of the overall healthcare system cannot be denied. Shortages of primary care physicians in a variety of settings has emboldened the rise of APRNs; meanwhile, even the Department of Veterans Affairs is finding broad support in their push for APRNs to practice autonomously within the VA system. 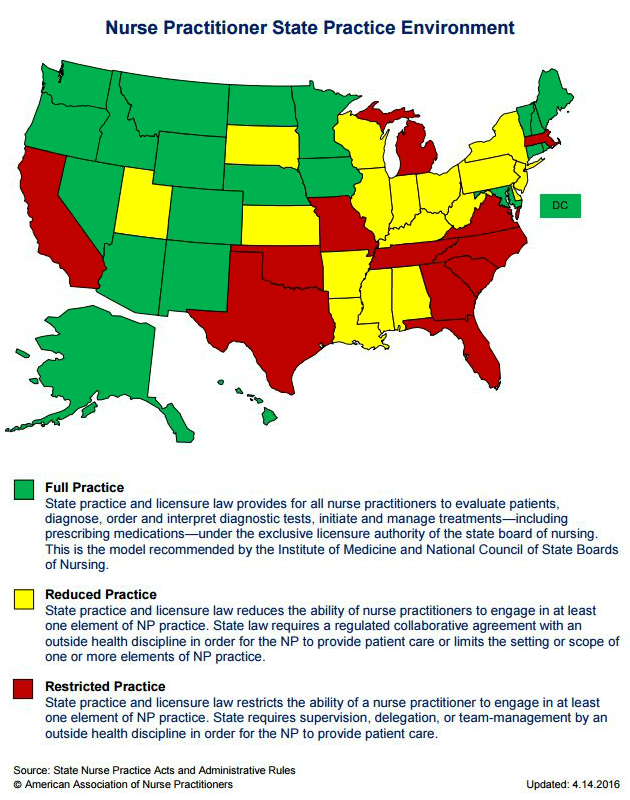 According to an interactive map (see below) from the American Association of Nurse Practitioners (AANP), almost half of the states in the U.S. allow APRNs to practice to the full extent of their license without physician oversight, allowing them to fully utilize their training, expertise, and professional acumen to benefit patients. Just over a dozen states have highly restrictive practice regulations for NPs, with the remaining states allowing what is deemed as reduced practice, most likely strongly supported by physician groups who oppose autonomous APRN practice. The Department of Veterans Affairs (VA) recently announced it is considering amending its rules so that all APRNs practicing within the VA system would be allowed to practice autonomously to the full extent of their license and training. Apparently, nurses groups and veterans groups are fully behind the proposed rule changes by the VA, whereas the American Medical Association and other physician groups are squarely opposed to any such changes. With wait times at the VA being the stuff of regular news headlines and stories, it seems this move is being proposed in order to stem the tide of veterans going without care for extended periods of time. Physician groups may eventually realize that opposing increased APRN autonomy is likely a losing proposition. Some states may hold out for as long as possible as others drop restrictive APRN practice regulations and allow APRNs to do what they are trained to do. Meanwhile, those states who have already loosened the reins may very well witness the mitigation of primary care provider shortages and an increased availability of APRNs in the areas of greatest need, such as Native American reservations, inner city neighborhoods and isolated rural areas. Geriatric primary care is only one population-based aspect of APRN practice that could see enormous gains as nurse practitioners fill the gaps left by physicians who have abandoned geriatrics for more remunerative medical specialties. If certain patient groups (such as veterans) are suffering due to shortages of providers, APRNs are well-trained, trusted healthcare providers who can certainly assuage that suffering. The calls to allow APRNs to practice to their fullest extent and autonomy will no doubt grow louder. It appears the time may have come for those opposing APRN autonomy to step aside, cease resisting and read the writing on the wall.